Obama File 95 Obama's Socialist Advisers Push Immigration Reform to "Create a Governing Coalition For the Long Term"
Why, in a time of high U.S. unemployment, is the Obama Administration seriously considering Rep. Luis Gutierrez's "Comprehensive Immigration Reform for America's Security and Prosperity" bill which would grant citizenship to up to 12 million illegal immigrants. The answer has little to do with humanity, national security or prosperity. It is all about power- raw socialist power. It is all about 8,000,000 more Democratic Party votes and the creation of a "governing coalition for the long term". At the "progressive" America's Future Now! conference in Washington, DC on June 2, 2009, SEIU International Executive Vice President Eliseo Medina addressed attendees on the issue immigration reform. Speaking of Latino voters, Medina said "when they voted in November, they voted overwhelmingly for progressive candidates. Barack Obama got two out of every three voters that showed up"
So I think there's two things that matter for the progressive community. Number one, if we are to expand this electorate to win, the progressive community needs to solidly be on the side of immigrants, that we'll expand and solidify the progressive coalition for the future..."
There you have the strategy. Fight for the illegal immigrants, grant them citizenship, then exploit their gratitude in the form of votes to create a "governing coalition for the long term, not just for an election cycle.."
As vice president of the radical SEIU, Medina has been the US's most effective immigration "reform" activist. His union, SEIU is also the major backer of the Gutierrez bill. Selling the legalization of millions of illegal workers to the US labor movement has always been an uphill battle. It was a huge turnaround in February 2000, when the AFL-CIO reversed its longstanding anti 'illegals' policy, calling for a new amnesty for millions of undocumented workers and the repeal of the 1986 law that criminalized hiring them. Eliseo Medina was one of the chief instigators behind that resolution. That fact is recognized by Democratic Socialists of America, the Marxist organization to which Medina has long belonged. 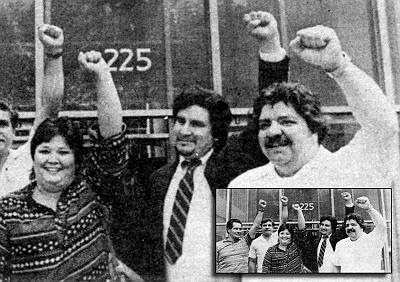 Eliseo Medina is widely credited with playing a key role in the AFL-CIO's decision to adopt a new policy on immigration a few years ago, and was one of the organizers of the Immigrant Workers Freedom Bus Rides in 2003. 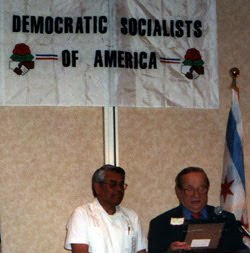 When Medina was honored by Chicago Democratic Socialists of America at their 2004 awards dinner, it was for his "vital role in the AFL-CIO's reassessment of its immigration policy". Had Eliseo Medina not turned around the AFL-CIO and had the SEIU not supported it, Congressman Gutierrez's bill would never have gotten off the ground. 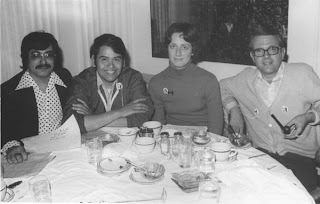 Medina's first interaction with the the fore-runners of Democratic Socialists of America came in Chicago when, in 1969, he was sent by Cesar Chavez to lead the Chicago grape boycott campaign. Medina came into contact with Carl Marx Shier, a member of the local Socialist Party of America chapter , later to be a key founder of the Democratic Socialists of America. Shier connected Medina with the Chicago Labor movement, a decision that "propelled Medina’s success with both the grape boycott and his career". 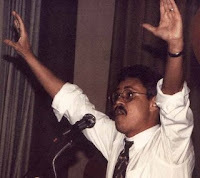 In 2004 Eliseo Medina became a Democratic Socialists of America honorary chair. In 2008, Eliseo Medina joined Barack Obama's National Latino Advisory Council, where he worked with DSA linked future Labor Secretary Hilda Solis, Luis Gutierrez and the co-sponsor of Gutierrez's immigration bill, the radical New York Congresswoman, Nydia Velasquez. Luis Gutierrez is regarded in Chicago as one of Barack Obama's biggest supporters. Eliseo Medina and Barack Obama , both have ties to Chicago Democratic Socialists of America, so it is not suprizing that Luis Gutierrez also has "connections". When Luis Gutierrez ran for Congress in 1998, Democratic Socialists of America did not officially endorse any candidates, as they did Barack Obama in 1996. But he was "recommended" as worthy of a vote, because of his membership of the DSA/Institute for Policy Studies created Congressional Progressive Caucus and for his support of Progressive Challenge-also a DSA/IPS "baby". In the mid 1990s, Luis Gutierrez served on the board of Illinois Public Action alongside DSA members Ron Baiman and Quentin Young , DSA supporters Jan Schakowsky, David Orr and Tom Balanoff, Communist Party member Frank Lumpkin and Soviet front leader Alice Palmer. Luis Gutierrez got his start in politics as an Chicago Alderman elected as part of the Harold Washington "movement". Washington was elected mayor of Chicago in 1983 by a coalition led by Chicago DSA and the Communist Party. It was Washington's election that inspired the young Barack Obama to move to Chicago - he even unsuccessfully applied for a job in the Washington administration. In the late 1970s, early 1980s, Luis Gutierrez was one of the leading US members of the Puerto Rican Socialist Party. Openly Marxist-Leninist, the PSP campaigned for Puerto Rican independence from the US. The organization maintained an unofficial "embassy' in Cuba and in the US was close to several revolutionary organizations including the terrorist Weather Underground Organization. Gutierrez was able to use his contacts in the Chicago City government to to secure government funds for the PSP sponsored cultural center and for Party sponsored social services and ESL and GELD programs. Incidentally, one of Eliseo Medina's comrades, DSA vice chair Jose LaLuz had also been a leading member of the Puerto Rican Socialist Party. In January 1976, Jose LaLuz, representing the PSP Central Committee attended the Weather Underground organized "Hard Times" conference, at the University of Chicago. The conference unsuccessfully attempted to unify several radical groups into a new unified communist party. In 2008, Jose LaLuz was Chairman of Latinos for Obama-a major Democratic Party effort to swing the Latino vote behind Obama. In 1999, Congressman Luis Gutierrez was one of a small group who successfully lobbied President Clinton to pardon 14 imprisoned members of the Puerto Rican terrorist group the FALN. In September 2007, controversy erupted in Chicago when it was discovered that Illinois governor Rod Blagojevich had hired Steven Guerra as an $120,000 deputy chief of staff for community services. It turned out that Guerra had spent nearly two years in a federal prison for refusing a federal judge's order to testify before a grand jury investigating a wave of FALN bombings that terrorized Chicago and New York City in the 1970s and 1980s. Guerra chose to be convicted of contempt even though he was offered immunity from prosecution in exchange for his testimony. A government informant had told investigators that Guerra was a member of FALN and recounted a June 1982 trip Guerra took to Puerto Rico to attend "a meeting of a cross section of terrorists." Guerra was identified at the meeting as "one of the leaders of the resistance in the United States..."
"The discussion at the meeting included detailed plans for the ambush of police officers and the destruction of dams through the use of explosives." Steven Guerra had originally been hired by Chicago City in 2003, on the recommendation of Luis Gutierrez. Defending Guerra, Congressman Gutierrez praised his longtime acquaintance who "made what he considered a principled decision, and he paid a heavy price for that decision." "I have known Steven for a long time. He is a good man who cares about making our state a better place to live," said Gutierrez. The question is-will Gutierrez and Medina's plans to "reform' immigration make the United States of America a better place? Is that even the intention? Or are America's illegal immigrants merely pawns in a cynical scam to give Obama's Democrats and their Marxist allies indefinite power-a governing coalition for the long term? What do 12 million human beings matter, when a socialist America is at stake? Well done! More excellent reporting by New Zeal! Facts organized all in one location. Obama, New Party, Ayers, Dunn, Jennings, Jones, Sunstein, Jarrett, Lloyd, Wright, School Indoctrinations, Soros, Cop-Killers, Cuban Spy Rings, Commie Media, Misinformation, Congress Investigation, plus details on Socialist/Communist Members of Congress like Nancy Pelosi, Barney Frank and over 80 others. Listen to Soviet Spy defector explain how communist takeovers are performed and Reagan's guidance on dealing with Communists. Learn what a Socialist, Communist and Progressive is. Examine ACORN, SEIU's and Union Communist leaders. See FBI files and testimonies. Catch up on Takeover News and study a Communist Takeover Plan from the 1960's, along with how to resist. Videos, links, pdfs. Trev...ummmm... more crappy politicians (communists) in Illinois...? Trevor, another great post. Further evidence of how deep the Communist/Socialist movement is embedded in the US Government itself. The re-push to grant amnesty to those who have "Broken in" to the US for the purpose of establishing one party rule is the goal. There is no humanitarian component at all, it is all about POWER and completing the mission of killing the United States of America and as Obama has said, "Fundementally Transforming the United States of America." Which if folks have been paying attention means transformation to a Socialist America complete with loss of liberty. Voting patterns can reverse. There used to be a "Solid South" where they always voted Democratic. Just love the raised, clenched fists of these bolshie losers. Shows what they will do just as soon as they ever get the power they so crave. Gig is up in November.